by Chris Woodford. Last updated: February 18, 2019. Lasers are the stuff of science fiction: big, heavy boxes that make blazing blasts of light. If you've ever seen an ordinary laser in a laboratory, you'll know it's quite a hefty beast: typically about as long as your forearm, fairly heavy, quite hot, and capable of producing a very intense beam of light. But if lasers are that big, how come we can use them in small things like portable CD players and handheld barcode scanners? The answer is that we don't! These things use a very different kind of laser that's about the same size as (and works in a similar way to) an ordinary LED (light-emitting diode). Known as semiconductor lasers (also called diode lasers or injection lasers), they were developed in the early 1960s by Robert N. Hall and, largely because they're so compact and inexpensive, are now the most widespread lasers in the world. Let's take a closer look! Artwork: Diode lasers are tiny, light, and compact—perfect for generating precision light beams inside small electronic appliances. What is a semiconductor laser? Chances are you've used a semiconductor laser in the last few days without even knowing it. If you've watched a DVD, you've "looked through" one; if you've been into a grocery store and had a barcoded product swiped through the checkout you've bought with one; if you've made a long-distance telephone call by fiber-optic cable you've "talked through" one; and if you've printed something with a laser printer your printout has passed very near one. Semiconductor lasers make powerful, precise beams of light (like ordinary lasers), but they're about the same size as simple LEDs—the little colored lamps you see on electronic instrument panels. 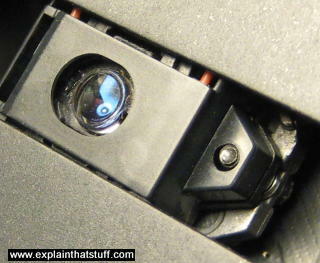 Photo: The smaller circle on the bottom left of this photo is a semiconductor laser diode in a CD player. The larger, blue-tinted circle on the top right is a lens that reads the reflected light bouncing down off the CD. 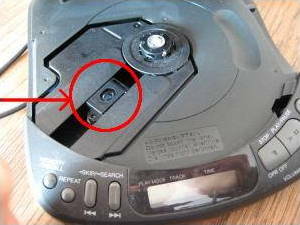 Never attempt to look at the laser light in a CD player: you could easily blind yourself. If you've read our article on diodes, you'll already have an idea how LEDs work. Essentially, an LED is a semiconductor sandwich with the "bread" made from slices of two different kinds of treated silicon known as p-type (rich in "holes" or, in other words, slightly lacking electrons, the tiny negatively charged particles inside atoms) and n-type (with slightly too many electrons). Put the two slices together and you make what's called a p-n junction diode that has all kinds of interesting properties. In a laser diode, we take things a stage further to make the emerging light more pure and powerful. Instead of using silicon as the semiconductor, we use a different material, notably an alloy of aluminum and gallium arsenide (indium gallium arsenide phosphide is another popular choice). Electrons are injected into the diode, they combine with holes, and some of their excess energy is converted into photons, which interact with more incoming electrons, helping to produce more photons—and so on in a kind of self-perpetuating process called resonance. This repeated conversion of incoming electrons into outgoing photons is analogous to the process of stimulated emission that occurs in a conventional, gas-based laser. 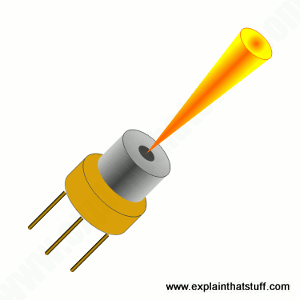 Artwork: The basic setup of a laser diode. Laser light is produced when electrons and photons interact in a p-n junction arranged in a similar way to a conventional junction diode or LED. One end of the diode is polished so the laser light can emerge from it. The other ends are left roughened to help confine the light. In a conventional laser, a concentrated light beam is produced by "pumping" the light emitted from atoms repeatedly between two mirrors. In a laser diode, an equivalent process happens when the photons bounce back and forth in the microscopic junction (roughly one micrometer wide) between the slices of p-type and n-type semiconductor, which is technically known as a Fabry-Perot resonant cavity (a kind of interferometer). The amplified laser light eventually emerges from the polished end of the gap in a beam parallel to the junction. From there, it goes on to read music from your CD, scan the price on your cornflakes, print out your college dissertation, or do a thousand other useful things! Early laser diodes could fire out only a single, relatively puny beam, but ingenious electronics engineers soon found ways to make them considerably more powerful. Since the 1990s, one common approach has been to mount a number of laser diodes on top of one another (like an apartment building) and then focus their individual beams into a single output beam using a collimator and/or lens. This kind of arrangement is variously called a semiconductor laser stack, stacked laser diode, or just a diode stack. Apart from making more power than a single laser diode, a stack opens up the possibility of generating multiple different wavelengths at the same time (because each laser in the stack can make a different one). 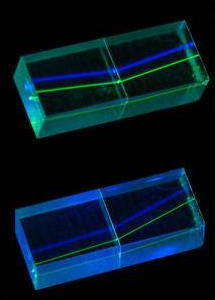 Instead of a single P-N junction, there are multiple ones, and the laser light beams emerge from the active layers in between them; typically, there's also at least one tunnel junction between the stacked layers. A single pair of terminals (sometimes called Ohmic contacts) feeds electrical power to the entire stack. Artwork: A simple stacked laser diode, comprising two diode lasers one on top of the other, and made from doped layers of aluminum gallium arsenide. The terminals (Ohmic contacts) are shown in gray at the top and bottom, the substrate (base material) is green, P-type layers are shown in blue, and N-type layers in red. The tunnel junction is labeled J2. 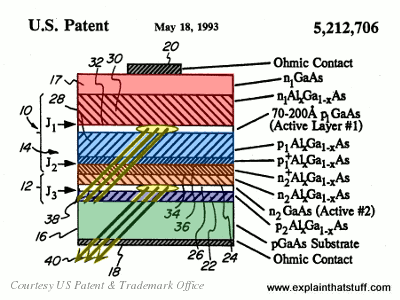 Artwork courtesy of US Patent and Trademark Office, from US Patent #5,212,706: Laser diode assembly with tunnel junctions and providing multiple beams by Faquir C. Jain, University of Connecticut, May 18, 1993.
Who invented semiconductor laser diodes? Artwork: Robert Hall's original laser diode patent, courtesy of US Patent and Trademark Office. A typical P-N semiconductor laser diode. 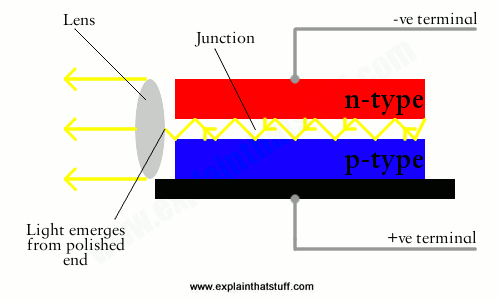 P-N junction region (resonant cavity) where light is produced by stimulated emission. This isn't drawn to scale! In Hall's original patent, it's described as being 0.1 micron (0.1 millionths of a meter, 0.1μm, or 1000 Angstroms) thick. Solder fixing upper electrode to p-type region. Highly polished rear surface, which must be precisely parallel to the front surface to ensure standing waves of electromagnetic radiation (laser light) are produced and emitted efficiently in the resonant cavity between the p-type and n-type regions. Surfaces 11 and 12 may be covered with mirrors or a metallic coating to improve the resonant effect. Side surface cut at an angle (or roughened) to prevent waves of light forming in other directions. Other side surface cut at a similar angle or roughened in a similar way. You can read much more detail in Robert Hall's patent, listed in the references below. What can we use diode lasers for? Photo: Laser beams bending (refracting) through a crystal. Photo by Warren Gretz courtesy of US Department of Energy/National Renewable Energy Laboratory (DOE/NREL). Ordinary lab lasers are big beasts, as we've already seen—not so different from the one Goldfinger famously used in the James Bond film of the same name. Putting it another way, anything remotely compact that needs a laser to power it is likely to use a diode laser rather than a "Goldfinger laser." CD players, barcode scanners, fiber-optic phone lines, dental tools, laser hair-removal devices, laser pointers, and laser printers all use diode lasers because they're small, compact, and inexpensive. It doesn't follow that they're low-powered and puny, however—for three reasons. Diode lasers can be surprisingly powerful (hundreds of watts is a perfectly achievable output). As we saw up above, you can stack diode lasers to make devices with far higher output (in the kilowatts). You can team diode lasers up with solid-state lasers (to make what are called diode-pumped solid-state lasers) or with conventional lasers, using them as "optical pumps" (instead of traditional flash tubes) to excite things like ruby rods (giving output in the megawatts). Britney Spears' Guide to Semiconductor Physics: An eye-catching way to interest people in laser diodes! Semiconductor-Laser Fundamentals by Weng W. Chow and Stephan W. Koch. Springer, 2013. High-Power Diode Lasers: Fundamentals, Technology, Applications by Roland Diehl. Springer, 2003. Semiconductor Lasers: Past, Present, and Future by Govind P. Agrawal. AIP Press/American Institute of Physics, 1995. Laser Li-Fi Could Blast 100 Gigabits per Second by Neil Savage. IEEE Spectrum. April 8, 2015. "Wi-Fi" networks using light instead of radio waves could send information more quickly and efficiently. BMW Laser Headlights Slice Through the Dark by Lawrence Ulrich. IEEE Spectrum. October 25, 2013. Cars are now using bright, efficient laser diodes instead of LEDs and halogen bulbs. The Transistor Laser by Nick Holonyak Jr. and Milton Feng. IEEE Spectrum, February 1, 2006. Can we look forward to a new era of transistor lasers that can produce both optical and electrical outputs? Laser 50th Anniversary: Robert N. Hall recalls the diode laser: The inventor of the laser diode looks back on how it happened. US Patent #3,245,002: Stimulated emission semiconductor devices by Robert N. Hall et al, General Electric. April 5, 1966. Robert Hall's early semiconductor laser patent. This is a detailed technical description of how the first semiconductor lasers worked by creating light inside a diode. US Patent #3,303,432: High power semiconductor laser devices by William E Engeler, Garfinkel Marvin, General Electric. February 7, 1967. Building on Hall's patent, this one outlines higher powered diodes of greater efficiency. US Patent #3,936,322: Method of making a double heterojunction diode laser by Joseph M. Blum et al, IBM. February 3, 1976. Describes a method of manufacturing laser diodes. US Patent #5,212,706: Laser diode assembly with tunnel junctions and providing multiple beams by Faquir C. Jain, University of Connecticut, May 18, 1993. An influential patent describes the basic idea of the diode stack laser. US Patent #6,236,670: Laser comprising stacked laser diodes produced by epitaxial growth inserted between two bragg mirrors by Julien Nagle and Emmanuel Rosencher, Thomson-Csf. May 22, 2001. An alternative approach to making a powerful laser from a vertical stack of laser diodes.